Royal Fables is India’s only platform that presents the world of royalty in all its majestic splendor. Every year it hosts in Delhi a two day exposition that showcases the art, craft, textiles and collectibles created within palaces and forts of India by young royals. This year in its 10th, Milestone Edition Royal Fables will be held on the 20th -21st September, 2018 from 11am-8pm at the Oval Room, The Mansion, Hyatt Regency, Bhikaji Cama Place, Ring Road, New Delhi. Visitors can travel through time to rediscover heritage through a very richly mounted exhibition. Entry to the exhibition is free. A master class on royal cuisine with Kunwar Hemender Singh of Bhainsrorgarh who cooks two of his classic recipes: Elaichi Kali Mirch Maas and bhutte ki khees. For a full regal experience participants can join in for a curated walk through the exposition, followed by lunch and the master class. 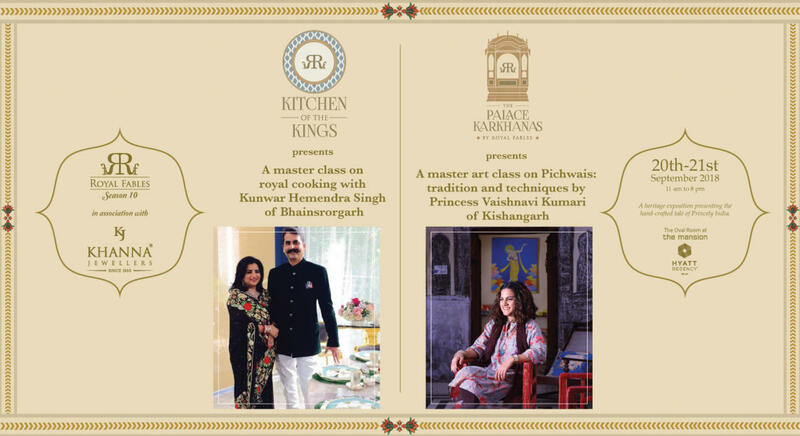 The Royal luncheon will be a coming together of recipes from the royal family of Sailana represented by Tikarani Shailja Katoch of Kangra- Lambragaon. A master class on the art of Pichwais: Tales and techniques by Princess Vaishnavi Kumari of Kishangarh, a SOAS graduate and a custodian of this dying school of royal art. On this day, the participants join in for a curated walk through the exposition and get a chance to witness the arts and crafts of Kashmir by the royal family of Jammu & Kashmir followed by lunch that will include recipes from royal kitchens.